Beaded baby bracelet with 7 rows of multi colored seed beads on white leather. Measures just over 1/2'' wide. 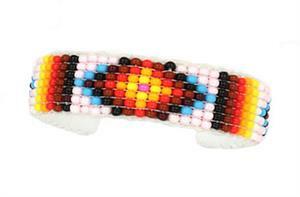 Wrist size measures approximately 3 1/2'' with 1'' opening. Colors and patterns will vary. Navajo crafted by Cornelia Footracer or Leonard Antonio. **Now only available in natural color leather. ***Available in blue, green, purple or pink as main color. Choose preference or let us choose for you.